In my opinion, flowers are the best way to add an eye-catching focal point to any table. After all, that’s why they’re called centerpieces, right? But professionally-created floral centerpieces, like the one pictured above, can get expensive, especially if you are on a tighter budget. That’s why many brides today are choosing to do their own wedding centerpieces. Surprisingly, it’s not as difficult as you might think. Over the years, I’ve worked with brides who have had some very creative and affordable centerpiece ideas. Pictured below is an easy and elegant idea for a tabletop, one that can be easily scaled to fit any size budget. Start by using glass cylinder vases like the ones pictured here. You can find them at Dollar Tree, Amazon or eBay as well. 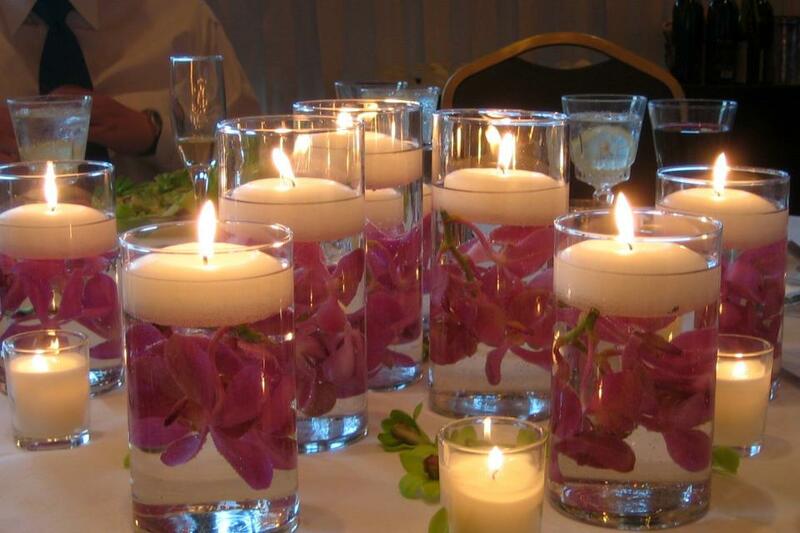 Add a few flowers like the dendrobium orchids used here, then fill with enough water to submerge the flowers. To complete the look, top it off with a floating candle and add a few votive candles on the table, and you’ve got an elegant arrangement for less than $10. 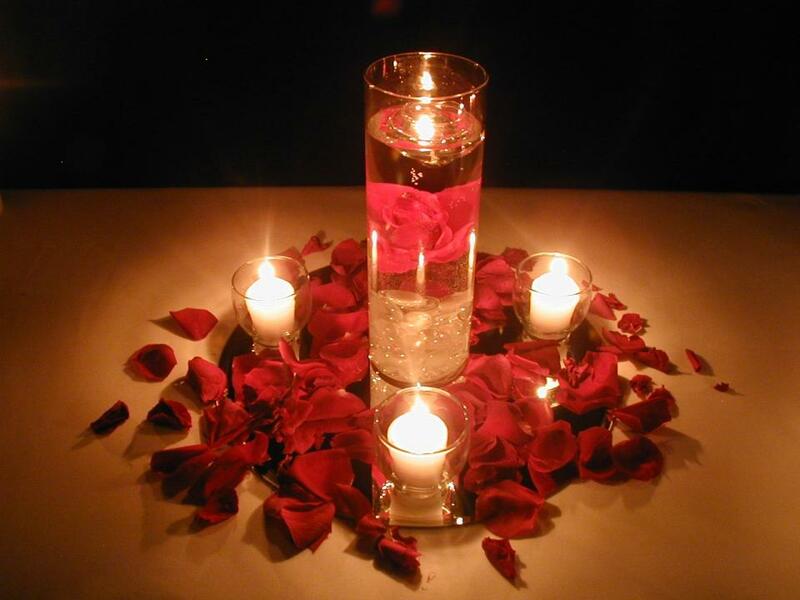 Another idea can be easily scaled to fit almost any budget is a single vase with a rose submerged and accented with fresh rose petals and votive candles pictured here. If fresh rose petals aren’t your thing, freeze-dried rose petals or fabric rose petals are other very affordable options. And don’t forget, it’s not necessary that every table use the same number of vases. Mix it up a bit. Use a single vase on one table, two on some, three on others. No matter what you come up with, it will look great! Balloons are another affordable idea that can be incorporated into your wedding decor. Although a bit more time consuming, they can have a dramatic effect on your wedding space, both indoor and outdoor. If you’re considering balloons as part of your wedding decor, I would recommend taking a look at Balloon Decorating Secrets. It’s an easy-to-follow step-by-step guidebook on creating balloon decor that anyone can do, including some simple wedding centerpiece ideas. 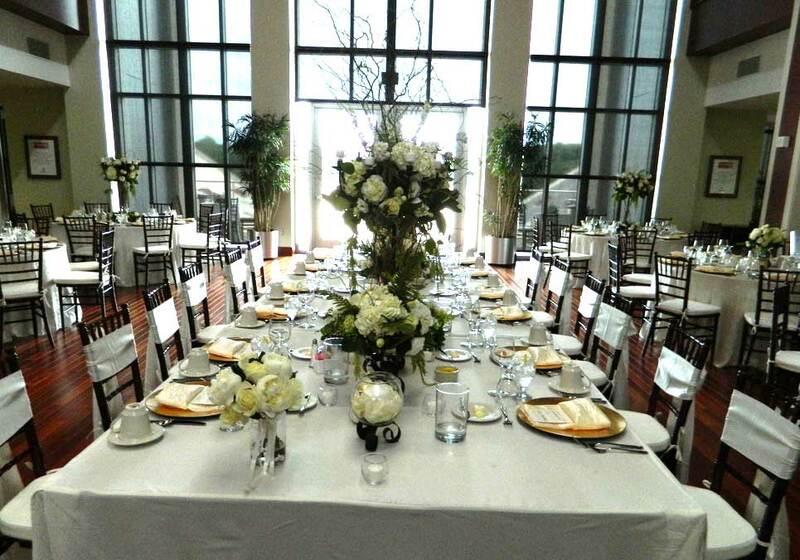 Finish with a few fresh flowers, and you’ve got a spectacular and memorable wedding centerpiece. If you’ve got another idea or two that you would like to contribute, feel free to comment below.